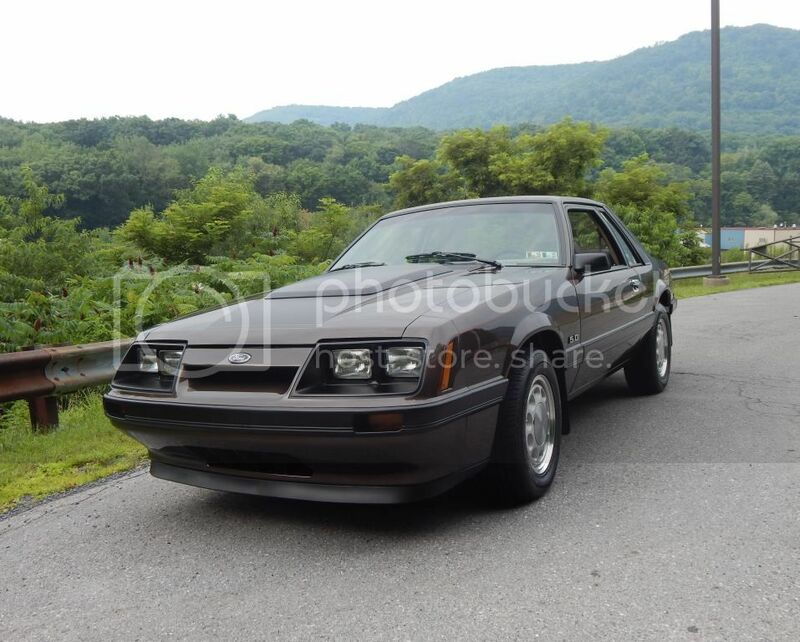 Congratulations to Jim Berry (FEP username slimj) and his 1985 Mustang LX Coupe as February’s Ride of the Month Winner! Jim’s story began in 2011 when he was able to purchase the 1985 coupe he had always wanted. The car unfortunately did not look then as it does today. So Jim decided he wanted to do a complete restoration of the Mustang. Jim also decided that due to the fact that a mere 55 Mustangs were painted in this unique color that he would repaint the Mustang it’s original hue. So with a lot of help from his brother the work began on this 85 coupe. The coupe was completely torn apart to start the restoration. Jim worked on it every day and every weekend for over a year to complete the restoration. To start with the interior was completely stripped from the car. All the glass, fenders, doors, hood and trunk were removed from the car before the painting started. The uni-body shell was painted in one spray booth and all the removed body parts were painted in another booth. Jim left no area untouched during the restoration and even the underside looks as beautiful as the top side. Once all the body parts were painted and reinstalled, Jim had the original red pin stripe painted on the car again by a local artist to complete the original look. Once the body and paint work were completed the attention turned to the chassis. The first item was swapping the 7.5” rear axle and 2.73 gears for a nice 8.8” with a set of 3.73’s to really spice up the acceleration. The rear axle was installed with all new bushing just as the entire front suspension was. All the chassis parts and drivetrain parts were treated to a good cleaning and a fresh coat of paint to give the whole car that brand new look. While working on the underside, Jim also installed new brake lines, struts, shocks, rotors, bearings, exhaust, and everything else he could find. The only item that wasn’t completely restored was the original engine, with only 83,000 miles on the engine, Jim felt it was in great shape and could be left alone for the time being. Jim took the time to sand and polish the original 10 hole wheels. Anyone who has ever washed a set of 10 hole wheels realizes just how much time and energy that took and can appreciate just how great they look! Jim kept the stock ride height by reinstalling the original springs, just giving them a sandblasting and a fresh coat of paint. He would love to lower the car, but doesn’t want to lose any ride quality due to the reduced ride height. Jim stated that although the restoration took about a year of hard work to complete, there weren’t really any challenges during the whole process. He also wants to thank his Brother for all the help in getting the Mustang to where it is today. Once again we want to congratulate Jim (and his Brother) on what a great job they have done with this beautiful coupe. The 1985 Mustang LX Coupe is an excellent example of what a lot of hard work, sweat equity, and TLC can do for any Fox. We look forward to seeing more of this coupe in the coming years and hope Jim has a blast driving and enjoying it. Great looking package all around! Love it! Amazing car, you should be very proud. Congrats. Thanks Wraithracing Awesome job !!! Again thanks everybody for all the kind words , Im not done with it yet I decided to lower it a little With all new springs and cc plates. And I would love to have the seats redone. And im sure I will find something else, Ha ha All and yes I love driving this car Should have done this along time ago . Can't wait to see it lowered a bit. She sure is a beauty! Congrats, its nice to see Brown get some respect. Congrats Jim! Your car looks great and the recognition is definitely deserved. Beautiful car and great job on the restoration. Congratulations. I love that you kept the original color & wheels. Gorgeous notch. Love everything about it!! Congrats!! Always loved that color! Might I suggest a set of biscuit leather Recaro's for the perfect interior? This is a really special car. Well deserved award! Very sweet looking coupe! Love the tan interior too, thats a pretty rare inside and outside color. Most of the ones you see nowadays are red! Congratulations on a beautiful restoration. Nice job!